A little fish may once again be making a big splash, if Pawel Michalak, a researcher at Virginia Tech's Virginia Bioinformatics Institute, has anything to say about it. (Phys.org) —A little fish may once again be making a big splash, if Pawel Michalak, a researcher at Virginia Tech's Virginia Bioinformatics Institute, has anything to say about it. In a paper featured on the cover of the Journal of Experimental Zoology, Michalak and a team of nationally recognized fishery scientists uncovered genetic factors contributing to the alewife's (Alosa pseudoharengus) ability to populate freshwater habitats. The alewife in recent years made history when it invaded the Great Lakes, surmounting the natural barrier of Niagara Falls, and established a purely freshwater population. As if that weren't enough, the fish favored as bait by lobster fishermen quickly edged out native fish and began wreaking havoc with lake trout and other native fishes. The alewife inadvertently decimated lake trout populations because consumption of the alewife leads to thiamine deficiency complex and early mortality syndrome. Without thiamine, fish swim in spirals, are lethargic, and usually die young due to immune complications. Now, researchers and fishery managers are trying to uncover just how the alewife has been so successful in transitioning from an anadromous lifestyle of moving between sea and freshwater to a strictly freshwater existence. The answer, it seems, might be within the beta-thymosin gene. "The 'freshwater allele' of the beta-thymosin gene seems to help the alewife function in a solely freshwater environment. 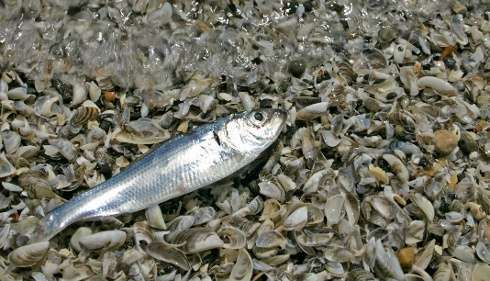 We also see decreased expression rates of beta-thymosin when alewives are exposed to fresh water," said Pawel Michalak, an associate professor at the Virginia Bioinformatics Institute. Beta-thymosin has a number of functions, including building of skeletons, wound-healing, and regulating cell mechanisms. Understanding the genetic underpinnings of the alewife's invasiveness is a critical stepping stone to successful management of the nuisance species, with implications for the entire Great Lakes ecosystem, including endangered native species. More information: Michalak K, Czesny S, Epifanio J, Snyder RJ, Schultz ET, Velotta JP, McCormick SD, Brown BL, Santopietro G, Michalak P. 2014. "Beta-thymosin gene polymorphism associated with freshwater invasiveness of alewife (Alosa pseudoharengus)." J. Exp. Zool. 321A:233–240.